"Investors and exchange users lost about $725 million in cryptocurrency in 2018 to exit scams such as fraudulent initial coin offerings, phony exchange hacks, and Ponzi schemes." On the surface $1.7b feels like an awful large amount of fraud relative to the total market cap of crypto. 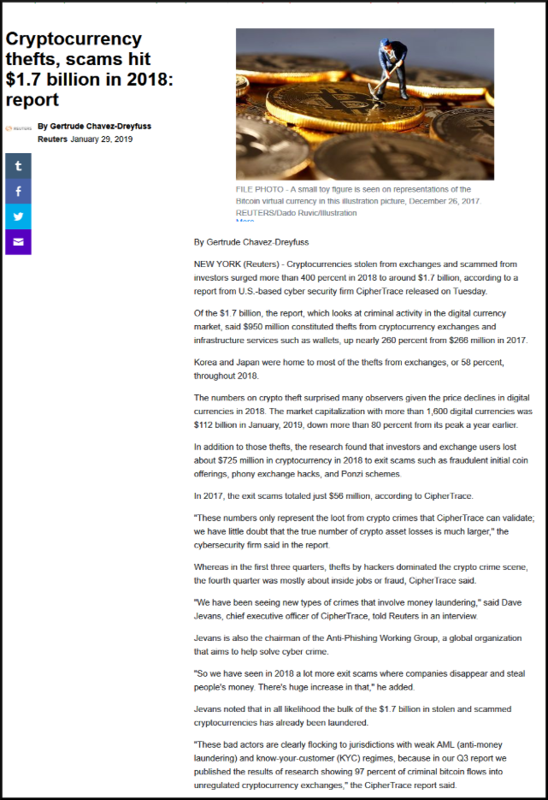 Raw numbers of course are larger for both credit card and investment fraud, but those markets run into the trillions. As a means of transaction if my credit card is fraudulently used max I owe $50 and probably $0. If something nefarious happens to one of my brokerage accounts, same protections. In light of this I fail to see how crypto is anything except a step back in all but the narrowest of uses. OneCoin alone is over $4 Billion Dollars, but I believe it is closer to $7 Billion Dollars and they are still signing people up. Consider there were over 130 new fake crypto-currency MLM programs launched from March 1 through September 30 in 2018. When you add in all the theft of real crypto-currencies by hackers of major storage houses, I can see it reaching $1.7 Billion. The theft from Mt. Gox alone was in the hundreds of millions of dollars.